Low intermodulation design and optimized return band prevents high cable modem signals from affecting forward band transmission. Therefore, the HS-3A series digital Splitter Is ideal for present and future multimedia applications including video, telephony, and transmission sensitive digital signals such as QPSK and QAM data. Ideal for digital and cable modem applications with high surge resistance and unique plating for unmatched corrosion resistance to withstand harsh environments. One Low-Loss Output (-3.5 db) and Two Low-Loss Output (-7.0 db, -8.0 db max.) Ports for different drop length applications. 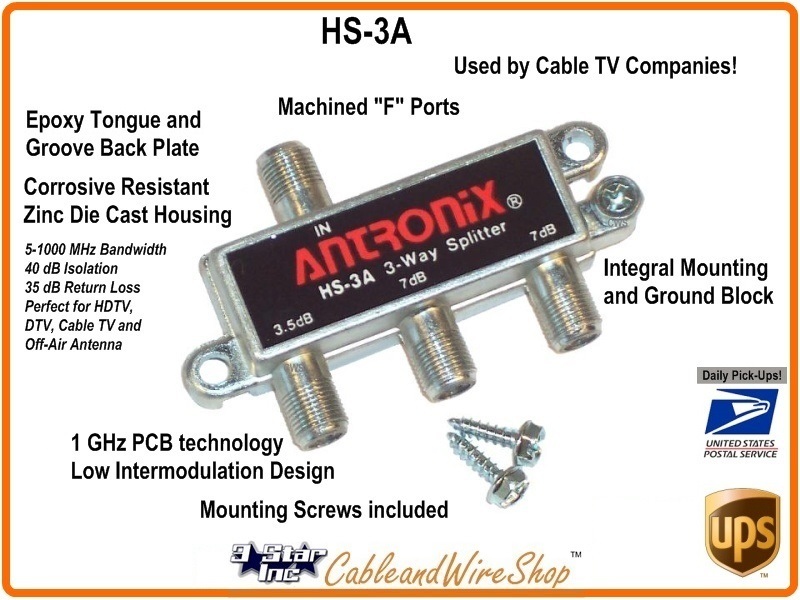 Note: This is a great Splitter for Inside and Outside Installation of the Home or Office. Its Double Thick Plated Housing is Soldered Closed and Sealed from the Environment, as well as Transient and Spike Voltage Resistant. The Finish Doesn't change colors as much as the Chemically Treated Housings do when subjected to Weather. It will pass Forward and Return signals; making it perfect for Splitting Cable TV with High-Speed Internet Connection Signals. The Voltage Protection also makes it suitable for splitting HD TV Antenna Signals as well. The Flat F Connector ends means that the connection to the RG coaxial cable you use (RG6 or RG11) is solid, secure and doesn't slip or back off after tightened with appropriate force (most Coaxial Cable Manufacturers specify in inch/pounds). When making RG6 or RG11 cable connections outside, a weather boot covering and some sort of Silicone compound are highly recommended. The fastest shipping I have ever seen! Great communication and very helpful!